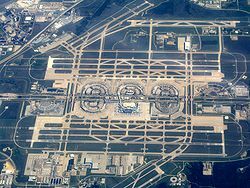 Dallas/Fort Worth International Airport (IATA: DFW, ICAO: KDFW, FAA LID: DFW) is between the cities of Dallas and Fort Worth, Texas. It is the busiest airport in Texas. 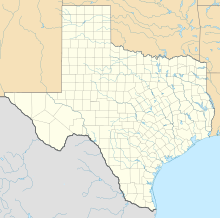 It serves the larger Dallas–Fort Worth metropolitan area. Regional, national and international flights use this airport. Flights go to 144 domestic and 47 international destinations. In 2010, it was the fourth busiest airport in the world in terms of aircraft movements with 652,261. it was the eighth busiest airport in the world when measured by passenger traffic, with 56,906,610 passengers in 2010. It is the main hub and largest hub for American Airlines. The airport is in the cities of Coppell, Euless, Grapevine, and Irving. The land for DFW was purchased by both Dallas and Fort Worth in 1966, and construction began in 1969. Terminal A at DFW Airport. Interior of Terminal D at the airport. Aerial view of Terminal E.
A Delta Air Lines airplane at the airport in 1988. ↑ 1.0 1.1 1.2 "Passenger Traffic 2010 FINAL". Airports Council International. Archived from the original on 2011-03-10. Retrieved 6 August 2011. ↑ 2.0 2.1 "Traffic movements 2010 FINAL". Airports Council International. Retrieved 6 August 2011. ↑ "About DFW International Airport". DFW Airport. Retrieved 6 August 2011. ↑ "Coppell City, Texas." U.S. Census Bureau. Retrieved on May 27, 2009. ↑ "Euless City, Texas." U.S. Census Bureau. Retrieved on May 27, 2009. ↑ "Grapevine City, Texas." U.S. Census Bureau. Retrieved on May 27, 2009. ↑ "Irving City, Texas." U.S. Census Bureau. Retrieved on May 27, 2009. ↑ "dfwairport.com - Airlines". www.dfwairport.com.